One of our favorite websites is Shutterfly! Did you know they make home decor as well as prints? We are in the middle of Spring cleaning, and I have SO many photos, that I do not even know where to start with them! Shutterfly has 16 home decor photo products, and I love the two new ones they just added! Missed the party? That's ok! We have our own prize here at MamaBreak as well! MamaBreak received a Shutterfly credit to review items here on the site. We did not receive any other sort of compensation. As always, our opinions and experiences are our own. 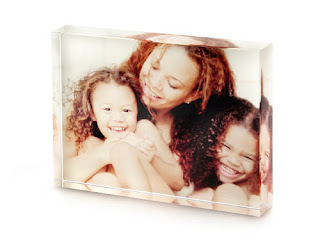 Enter below to win a 5x5 Acrylic Block! I lik the Classic Initial Wedding Canvas. I like the modern portrait. I like the Monogram Black. I like the Growing Up Collage. The growing up collage and this is very cute. Love the 3-d effect. Ihad no idea tha they did more than just prints! Awsome! I really like the Monogram Black! Growing Up Collage Canvas Print - thank you. I like the "Classic Baby" canvas print - it would totally match our baby's room! i like the monogrammed black canvas print. I like the Photo Gallery. My favorite is the Photo Gallery Canvas Print! I like the "Hand-Lettered Love" the best. kristiedonelson(at)gmail(dot)com Thank you. 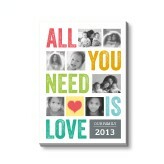 I love the All You Need Is Love one. Love the "Hand Lettered Love" one. Here is nice post and i like it very much so keep it up.